As the Australian economy motors forward, while we continue to bump along the bottom of the recession, it is not surprising that envious glances are cast across the Tasman. How, it is asked, have the Aussies managed it? The most obvious explanation is that they have a huge mineral resource that the world – and particularly the Chinese – are keen to buy. If only we were similarly blessed, so the argument runs, we would do just as well. That, presumably, is why such high hopes are pinned on the discovery of new oil and gas reserves, and why it is proposed to dig up some of our most beautiful and vulnerable landscapes in search of coal and other minerals. I take leave to doubt, however, that success in these ventures would improve our fortunes. Each economy has a different mix of components, and it does not matter very much whether – over the longer term – one component is bigger in one economy than in another. What matters is how we respond in policy terms to the mix we have and to changes in that mix. It is not the hand we are dealt but how well we play that hand that counts. And the omens in that respect are not encouraging. A classic case in point was the UK experience with North Sea oil. By the time the oil came on stream, in the early 1980s, the UK had adopted a monetarist policy stance. Monetarist theory predicted that an increase in oil production would lead to a rise in the exchange rate. A higher pound would make manufacturing less competitive, with the net effect that the oil production would simply replace a swathe of manufacturing capacity with little or no gain to total production. As the oil revenues began to flow, policy-makers – convinced as they were by the theoreticians’ predictions – were content to watch the exchange rate rise and did nothing to counteract it, with the result that manufacturing did indeed contract as oil production rose. The Dutch had a similar experience – to the point that the adverse effects for their economy were dubbed the “Dutch disease”. The Norwegian experience of North Sea oil was very different. They paid no attention to monetarist theory. They succeeded in ring-fencing the proceeds of the oil (largely by using them to buy assets abroad) so that their exchange rate remained stable. The benefit to the trade balance allowed them to grow faster than would otherwise have been the case, and – as growth in oil production eventually slowed – the repatriated profits from overseas assets were re-invested in the Norwegian productive economy so that good levels of growth were maintained. There are no prizes for guessing which course we would follow in the event that we discovered major new sources of mineral wealth. We do not need a crystal ball when we can read the book. 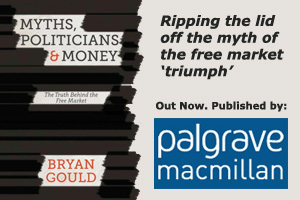 Not only have our policy-makers slavishly followed monetarist prescriptions over a long period, but we have some useful case studies of our own to guide us. Those instances exhibit the same errors in policy-making as those made by the British and the Dutch. A recent example has been the rise in world dairy prices. Our response was to allow the exchange rate to rise (thereby wiping out any gain to domestic profitability, investment and growth) all because we see high dairy prices as an inflationary problem – requiring a tighter monetary policy – rather than as a stimulus to better economic performance. Even more telling – and depressing – is another instance. It can be argued (and I am indebted to my colleague, Brian Easton, for this point) that we have already discovered a new source of wealth – not new mineral discoveries or even higher prices for our primary produce – but overseas borrowing and the sale of our assets to foreign buyers. The impact of this “new income” on our productive capacity – under the current policy regime – is just the same as the impact that North Sea oil had on the British and Dutch economies. The only difference is that, unlike them when the oil began to run out, we will find when our borrowing capacity is exhausted that we not only have to do without it but have to pay it back. Our policy settings ensure in other words that, even if we suddenly discovered huge reserves of oil or gold or whatever, we will waste the potential for growth by taking the benefits in higher consumption (through a higher exchange rate and therefore cheaper imports) rather than through production-focused investment. Moreover, the new wealth would actually displace productive capacity – the very reverse of the priority that the government believes it is giving to the productive economy. If we want to do better, we need not complain that we have not been as fortunate as the “lucky country”. We should be making our own luck. This article was published in the New Zealand Herald on 23 March.